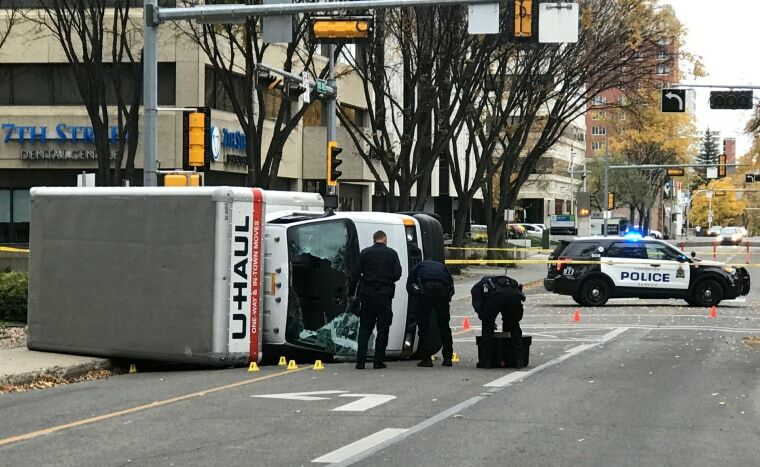 The 30-year-old man suspected of a terrorist rampage that injured a police officer and four other people in Edmonton, Alberta, on Saturday night is a Somali national pursuing refugee status who had previously been investigated for "espousing extremist ideology," authorities said Sunday. The suspect, whose name wasn't released, was arrested after the attack on suspicion of attempted murder and various terrorism charges, police said. The previous investigation, which occurred in 2015, concluded without enough evidence to pursue criminal charges, said Marlin Degrand, assistant commissioner of the Royal Canadian Mounted Police. "At that time, he did not show signs warranting keeping him any further," Degrand said, adding that until Saturday, he "hadn't done anything negative towards the police." Degrand said the suspect was in the refugee claimant process, although he didn't provide additional details. The injured officer was released from the hospital Sunday and was expected to make a full recovery, despite having been stabbed several times, Edmonton Police Chief Rod Knecht said. "He was in a struggle for his life, holding on to his gun with one hand and blocking the knife in the other," Knecht said. Two of the other victims have been released from a hospital, Knecht said, and a third was listed as stable. The fourth victim suffered a fractured skull and was being held for observation, he said. The attack began Saturday shortly after 8 p.m. (10 p.m. ET), when the a Chevy Malibu drove into a police officer stationed outside a Canadian Football League game, sending him flying 15 feet into the air, Edmonton police said. Before fleeing, the driver jumped out of the car and repeatedly stabbed the officer, police said. Just before midnight, police said, the suspect led officers on a high-speed chase while driving a U-Haul truck. Knecht said the driver nearly T-boned multiple cars and appeared to aim for pedestrians. Four people were struck. Police have described the man as a lone-wolf attacker.